Shop Fan's Fashion online at FansFashion.com which carries Adidas and Artrock backpacks, bags, and apparels in martial arts and sports-related styles. Fan's Fashion products range from school backpacks, day packs, travel backpacks to sports bags, duffel, t-shirts, sweat shirts and suits. Save on your next purchase from FansFashion.com with discounts, coupons, promotions and savings from 58coupons.com. Hurry on over to Fan's Fashion to save 5% store wide with this coupon code. 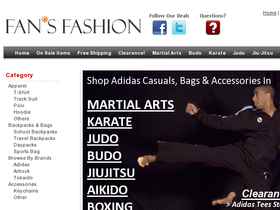 Enjoy Free Shipping on Adidas Martial Arts Apparel from Fan's Fashion. Click link to start shopping. Check out the Hot Deals Category on Fan's Fashion and save up to 20%. Click link. Head on over to FansFashion.com to save up to 20% on large traveler backpacks. Click link to see the variety. Saving of 10% when you buy Two or More of the Same Martial Arts Styles from Fan's Fashion. Click link for selection. FansFashion.com has a selection of backpacks discounted up to $20. Click link to view. Enjoy free shipping on select Backpacks from Fan's Fashion. Click link to start saving.